TOTTON Recreation Club stalwart Steve Allen has made it a hat-trick of successes on the Cuestars Masters midweek tour. 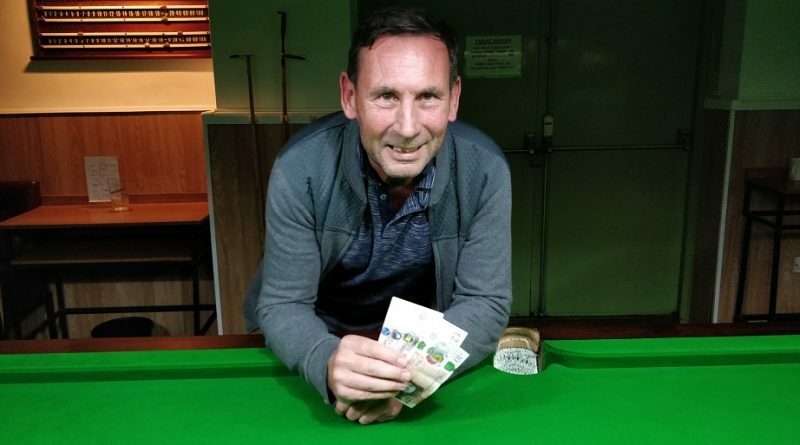 Allen, who won the inaugural events in Salisbury and Chandlers Ford last season, kicked off the new campaign with victory at the Greenbaize Snooker Club, Bournemouth. He pocketed £50 after beating Phil Morgan (Salisbury) 2-1 in the final. It was the first frame he had dropped all day. Allen was undefeated in the round-robin group stages and beat Herman Desmier (Wimborne) 2-0 in the last-four. In the second semi, Morgan, who collected £30 and recorded the day’s highest break of 41, overcame Andrew Darken (Feltham) 2-1. ROUND-ROBIN GROUP A: 1st, Steve Allen (Totton Rec); 2nd, Andrew Darken (Chertsey SSNR Club); 3rd, Stephen Hills (Traders, Northfleet); 4th, Paul Burt (Salisbury SC). ROUND-ROBIN GROUP B: 1st, Phil Morgan (Chandlers Ford SC); 2nd, Herman Desmier (Bournemouth & District Constitutional Club); 3rd, Richard Fullard (Greenbaize, Bournemouth); 4th, Richard Arnold (Salisbury SC). SEMI-FINALS: Allen 2-0 Desmier, Morgan 2-1 Darken. FINAL (£50/£30): Allen 2-1 Morgan.